Hi everyone, happy Monday! Did you all have a great weekend? We got snow in Vancouver on Thursday night, and unlike normal, it actually stayed around! We have our car parked on the street (and T's work vehicle in the parkade) and I had to brush & scrape the snow and ice off it today, three days later, when I went to get groceries! 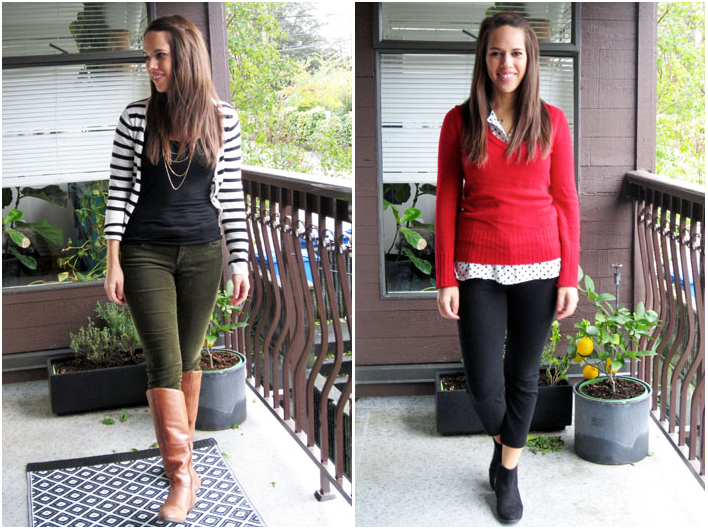 Here's a look at the outfits I wore last week! I managed to avoid the temptations of Black Friday and Cyber Monday sales, how about you? There were definitely great deals to be had, but nothing on my "must have" or "need" list and I'm really trying to stick to a budget - plus, with the holidays coming up I know I will be spending money not just on gifts, but more dinners out, hostess gifts and booze. I'll be back on Wednesday with my Monthly Outfit Roundup for November! Love the floral print dress with tights and boots, and your black and white striped cardigan, but all your outfits are cute!